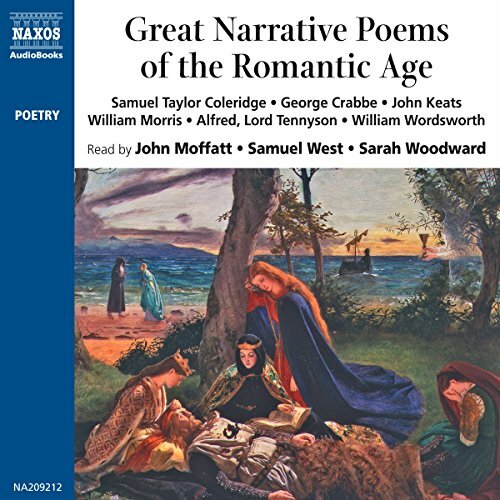 A stunning introduction to six Romantic poets: Keats, Tennyson, Wordsworth, Coleridge, Morris and Crabbe. Each narrative poem is long enough to reveal the poet's style and to distinguish itself from that of the others. The three narrators are beautifully cast. With a mesmerizing voice, Samuel West is truly brilliant, giving evocative, powerful narrations. Here are some of the finest narrative poems in the English language, dating from an age of rich inspiration: the 19th century. All tell powerful stories of human passion and endeavor, often reflected in vivid evocations of the medieval world. Includes "The Eve of St. Agnes", "Morte d'Athur", and "Peter Grimes". (P)1996 NAXOS AudioBooks Ltd.; ©1996 NAXOS AudioBooks Ltd.
very enjoyable indeed. five stars. much enjoyed. good diction, good mood, slightly too American in parts but bearable.go get it!